When you see the likes of NetEnt, Microgaming, and Evolution Gaming as main developers, you know that a casino means business. Captain Charity also has a license by the gambling commission of Malta and the United Kingdom. They are considered as two of the best regulators in the industry. 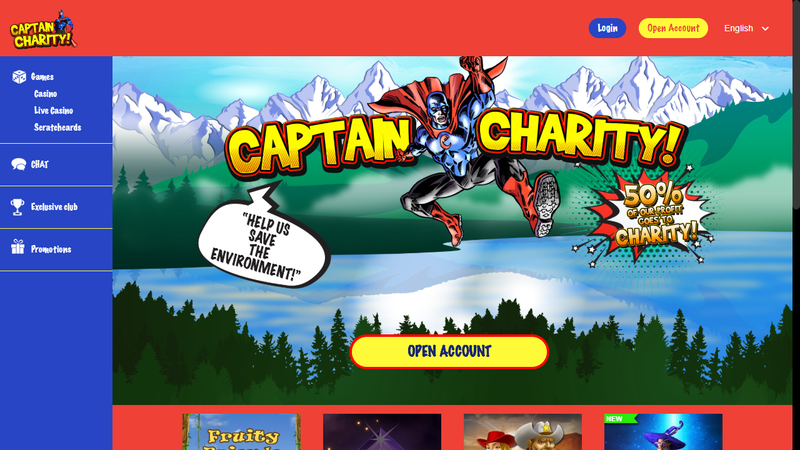 Captain Charity is a new online casino that gives 50% from its profits to charity. The noble cause doesn’t hurt the quality, as the operator has a solid platform that also works on mobile devices such as iPhone, Android, and other widespread phones and tablets. If you are interested in the app, check our complete review. Thanks to HTML5, you won’t have to spend time visiting the iTunes App Store or downloading APK files to play at Captain Charity. The casino’s website is mobile responsive and compatible with iPhone, iPad, Android, and even Windows Phone. Simply open the web-app and you will be ready to go without a download. This approach has a couple of other advantages as well. The most important among them is that Captain Charity won’t have to support a couple of different apps. 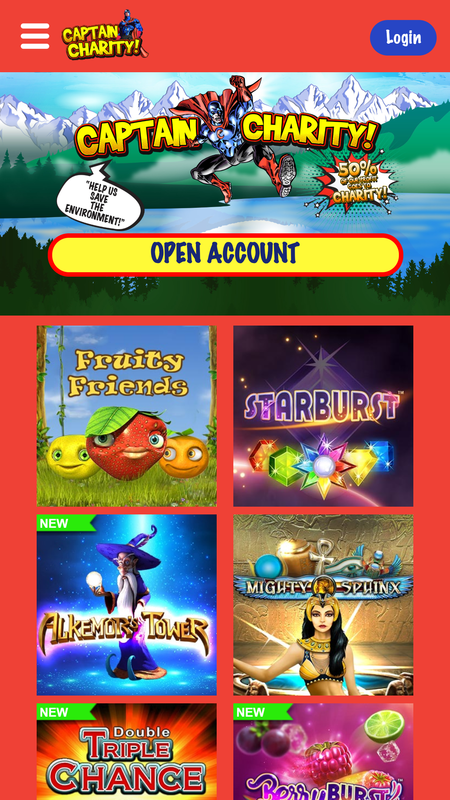 The casino is the same for all platforms which means new features can be launched much quicker. Initially, the Captain Casino mobile app was a bit slow in terms of loading, but this issue seems to be fixed. The site opens quickly and has a nice design, predominantly in red. What’s more important is the rather simple user interface that allows you to quickly browse around. You can access the games from the navigation menu in the top left corner. Captain Charity offers a decent collection that works on mobile without a download. It is powered by a couple of renowned developers such as NetEnt, Microgaming, and Evolution Gaming. You can play slots, classic table games, scratchers, and even live casino games. They all work on iOS, Android, and Windows Phone without a download. You can easily contact the Captain Charity support on the go. Simply open the live chat from the main menu and an agent will be there to help. You could also send an email and the reply will arrive within 24 hours most of the time. When it comes to payments, Captain Charity offers a decent selection of options. Unfortunately, PayPal is not included, but Neteller and Skrill are solid alternatives. Of course, all of the promotions of Captain Charity are also part of the mobile app. The casino offers a solid welcome bonus and a loyalty program called The Exclusive Club. To learn more about them and other offers, simply visit our Captain Charity overview page. Despite the early problems with the performance, Captain Charity currently runs smoothly on all major mobile platforms without a download. You can have a good time on iPhone, iPad, Android, and other phones or tablets or manage your account in terms of payments and support. Please gamble responsibly! You must be 18+ to use this site!